MPS Web Editors can help create accessible content by following our accessibility guidelines. Here's a quick check-list to make sure your web content is accessible to users with disabilities. Make sure all images have alt-text. When adding an image in Urban Planet, remember to always add "alt-text" to the image in the title field of the image upload. Remember to make your alt-text descriptive (e.g., "photo of students playing outside" instead of "students playing." You should use headings and subheadings to improve the structure of your page. This helps people using a screen-reader navigate your page more easily; it also helps people with vision to scan your page more easily and improves your SEO. You can add headers using the ribbon in the editing window of Urban Planet. Look for the "styles" drop down menu. You should use headings first, then "nest" your subheadings within headings as appropriate. Bulleted texts are easier to scan, which improves the user experience for both people with disabilities and people without disabilities. Avoid creating lengthy paragraphs and instead consider using bullets. 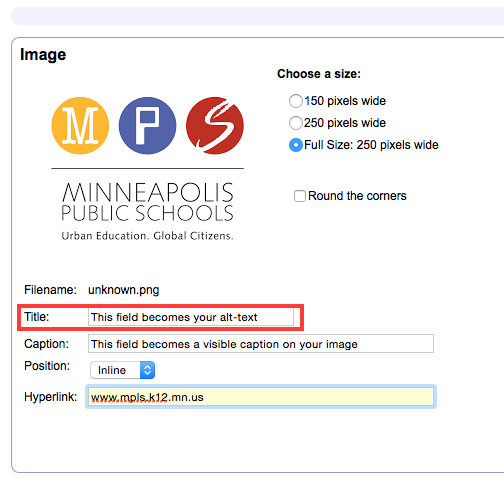 Avoid things like "click here to go to the Minneapolis Public Schools homepage." Instead, try "visit the Minneapolis Public Schools Homepage." Avoid "learn more about Emerson Spanish Immersion School," and instead use "learn more about Emerson Spanish Immersion School on their website." Don't use special fonts or colors. Stick to the defaults. Urban Planet fonts are designed to be legible to all users. Please don't change the fonts by adding special colors, highlighting texts, or trying to change the fonts. Never edit the source code of the page. Use the formatting options provided to you. Use the bold, italics and underline options available in Urban Planet to emphasize and differentiate content. An excellent overview of six core skills to help make your web content more accessible. From the University of Minnesota. Provides a basic outline of how to make web content more accessible. This page introduces some basic considerations to help you get started writing web content that is more accessible to people with disabilities. This resource introduces how people with disabilities, including people with age-related impairments, use the Web. It describes tools and approaches that people with different kinds of disabilities use to browse the Web and the barriers they encounter due to poor design.